If you or a loved one has been injured in a Florida truck accident, an attorney may be able to help you file a claim with the truck driver’s insurance company to recover compensation for your losses. If the claim does not settle out of court, then an attorney may be able to help you file a lawsuit against the trucking company. The claims process to collect damages from the party responsible for causing your accident can be complicated. However, The Ortiz Law Firm has the experience needed to navigate these types of claims. These claims will typically be filed against the trucking company that owns the vehicle and not the driver himself. The trucking company will likely have insurance to cover motor vehicle accidents caused by the company’s drivers. Given the fact that you will be dealing with larger-scale defendants and their insurance companies (who are themselves well-experienced in handling injury claims), you should seriously consider retaining the assistance of an attorney who has experience handling such claims against large corporate entities. At the Ortiz Law Firm, Mr. Ortiz has handled personal injury claims against large trucking companies and insurance carriers. If you or a loved one has been involved in a Florida truck accident, you may have a legal claim for damages. To learn how our Pensacola truck accident attorney may be able to help you recover compensation for your losses, please fill out our no cost case review form today. Many accidents of the road involve 18-wheelers, big rigs, delivery trucks and other large trucks, which automatically have the handicap of being much larger than other vehicles. To be qualified for compensation for a truck accident, you and your lawyer must be able to prove that the other party’s negligent driving was the cause of the incident. Even if you are found to be partially responsible, you can still receive damages if more of the fault was with the other party. Some of the ways truck drivers can easily cause severe accidents is driving while drowsy, not properly inspecting their vehicle (including regularly checking brakes, engine fluids, lights and mirrors), tailgating and failing to pay attention to blind spots and other hazardous areas. How Can A Pensacola Truck Accident Attorney Help Me? If you have suffered serious injuries or lost a loved one in a truck accident, there are a number of parties – including the truck driver and trucking company – who may be liable for your losses. However, it is common for these parties to deny responsibility (fault or liability) for a crash. An attorney can help you prove liability for your crash, collect evidence to strengthen your claim in support of your “proof of loss”, and help ensure compensation is sought and obtained all responsible parties. Consult and retain experts to reconstruct the accident scene and recreate the accident. The manufacturer of the truck, trailer, or components. Whether there are any potential product or manufacturing defects. Given the size and weight of the vehicles involved in a truck accident, the cost of treating your injuries will likely exceed the amount of your Personal Injury Protection (PIP) insurance coverage. To collect compensation for your losses that are not covered by PIP, as well as any other damages you are eligible to receive, your lawyer may have to engage in extended negotiations with the insurance company. If such out-of-court negotiations are unsuccessful, your attorney may need to file a lawsuit for additional damages. If you have lost a loved one in a truck accident, you may have the standing and right to a wrongful death suit. Hiring a qualified attorney can help ensure you recover the compensation to which you are entitled. After all PIP benefits have been exhausted, victims with injuries exceeding the “tort injury threshold” may pursue additional “non-economic” compensation for their “pain and suffering”. Fatigue or driving for too long without taking a break. the breach of duty caused the injury. In some instances, multiple parties may be responsible for the injuries. For example, the owner and manager of the trucking company, the owner of the truck, the employer of the driver, and their respective insurance companies may be liable after a crash. The truck’s performance had not changed since its initial sale. Product liability suits may also be sought under a legal theory of strict liability where proof of negligence is unnecessary. However, claimants must prove the defect originated in the manufacturing process to prevail. This will require detailed analysis, testing, and testimony by experts. Unfortunately, truck accidents are often so severe that one or more of the victims does not survive the crash. In some cases, the surviving family may bring a claim on behalf of the deceased loved one to recover compensation for their losses. Wrongful death claims require the family to prove the same legal elements as the deceased, had the decedent survived and pursued a claim on their own. An experienced wrongful death attorney can help family members recover economic, non-economic damages for the loss of their loved one. In certain cases, the attorney can help recover punitive damages. Compensation for injuries and damages from a truck accident is typically separated into two categories: economic losses and non-economic losses. As previously stated, punitive damages may available, in some cases. Current Medical Expenses: Such expenses may include fees and medical bills for emergency room visits, hospital care, surgery, physical therapy, assistive devices and appointments with approved medical professionals. Future Medical Expenses: In all too many cases, the injuries sustained in truck accidents are so severe that they will require extended future medical attention and care. Lost Wages: Some injuries are so severe that they prevent the victim from returning to work – either temporarily or permanently. Florida law permits the recovery of compensation for the wages lost between the time of injury and the conclusion of the lawsuit. Loss of earning capacity: If the victim can demonstrate that his or her ability to earn a living has been negatively impacted, additional compensation may be available for this lost earning capacity. While past wages may be considered in determining the amount of this award, the jury or insurance adjuster will try to determine the amount victim could have earned had the car accident not occurred. Pain and Suffering: This includes compensation for having to endure the physical pain suffered as a result of injuries sustained in the crash. The nature of the underlying injuries, the intensity of the pain, and the length of time the victim is expected to suffer pain are all included in the calculation of this award. Mental Anguish: Truck accident victims can also be awarded for emotional pain suffered as a result of the truck accident. Mental anguish damages compensate the victim for fright, embarrassment, nervousness, worry, grief and other forms of emotional distress caused by the accident. Loss of Consortium: The uninjured spouse may be able to recover damages for the loss of certain marital benefits due the spouse’s injuries, including the loss of companionship, sexual relations, affection and comfort. Punitive damages may also be awarded if the defendant’s actions causing the injury were willful, malicious, or intentional. Punitive damages are intended to punish the offender and deter similar behavior in the future. Truck drivers have very specific rules to follow as set down in the Federal Motor Carrier Safety Regulations. Trucking companies are required to check the criminal backgrounds of any driver they hire and monitor all employees through driving logs. This is done to ensure that drivers are following the rule of maximum hours of driving they may do per day. In this way, the likelihood of an accident due to inattentiveness can hopefully be avoided. Once a year, a truck driver’s records are inspected and if repeat violations of regulations are visible, steps are taken to remove them from the road. 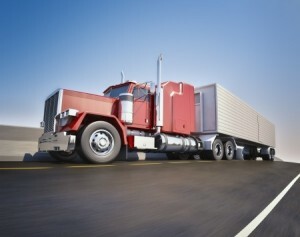 A large truck is legally defined as a vehicle weighing more than 10,000 pounds. A 2008 federal report stated that 11% of all motor vehicle traffic fatalities in the country involved large trucks. Of those who were killed in these accidents, 16% were occupants of the large trucks, while 74% were not. It is fairly common for drivers of large trucks to have convictions for speeding, an action that is one of the main causes of traffic accidents, causing 31 percent of all road fatalities. 11, 674 people died in 2008 accidents involving speeding, according to the National Highway Traffic Safety Administration. In 2008, 677 Americans were killed in accidents involving large trucks, 263 of which were in Florida. Someone in the United States is injured or killed every 16 minutes by an accident involving a large truck. Over 400,000 accidents involving large trucks occur in the country every year. Around 140,000 people are injured every year by these accidents. Around 3,700 people are killed each year in these accidents. About 700 occupants of large trucks are killed in crashes every year. Big-rig trucks, semi trucks and tractor-trailers weigh up to 30 times more than the average passenger vehicle. Fatigue is the most common reason for a big-rig truck accident. A large truck traveling at 55 mph can require the entire length of a football field to stop. Most fatal truck accidents, approximately 66%, happen during the daytime. 62% of fatal truck accidents happen in rural areas. In 2007, drivers of large trucks with a blood alcohol concentration of 0.089 or higher (legally drunk) were involved in 1% of fatal traffic accidents, while similar drivers of smaller passenger vehicles made up 23%. Those of smaller trucks made up another 23% and those of motorcycles made up 27%. 24% of all big-rig truck drivers who were part of fatal crashes in 2007 had prior speeding convictions. The same year, only 19% of passenger vehicle drivers with prior speeding convictions were involved in fatal crashes. During your attempts to file a claim against a trucking company, you should watch out for some of the tricks the insurance company could possibly pull. Never agree to give a recorded statement, since these can be manipulated into damaging evidence against your case. A written interview is all that should be necessary. Also, it is usually unwise to accept the first offer of monetary settlement, as insurance companies will typically begin much lower than they are allowed to go. Only accept an early settlement if it is equal to the damage caused. One must not assume that only the drivers of big rig trucks are the cause of damaging accidents. In some cases, the negligent drivers of smaller vehicles are the ones that cause accidents. If you are involved in an accident with a larger vehicle, the other party will not automatically be responsible for damages. If you are considered the sole cause of the accident, you do not have a case for damages. Accidents involving large trucks can be far more severe than other road accidents. These accidents can be severe, often resulting in traumatic brain injuries, spinal cord injuries or paralysis, conditions that can cause long-lasting disability and expensive medical bills. If you or a loved one has experienced personal injury, including physical and mental pain and financial impairment due to medical wages and loss of work, you are entitled to monetary compensation. If you have been in a truck accident in Florida, you will need an experienced lawyer to handle your claim. Contact an attorney as soon as possible. There is a limited time you have to file an insurance claim and/or bring a claim against the responsible parties. To learn how our Pensacola truck accident attorney may be able to help you, please fill out our no cost case review form today, or call our office at 850-308-7833 to schedule a Free Case Evaluation.